Wooden boat aficionados spent two days boarding classic vessels and enjoying a variety of related activities during Koehler Kraft’s 23rd annual San Diego Wooden Boat Festival, held on Father’s Day weekend. Dads and their families walked the docks during the June 15-16 show at the Koehler Kraft boatyard on Shelter Island. 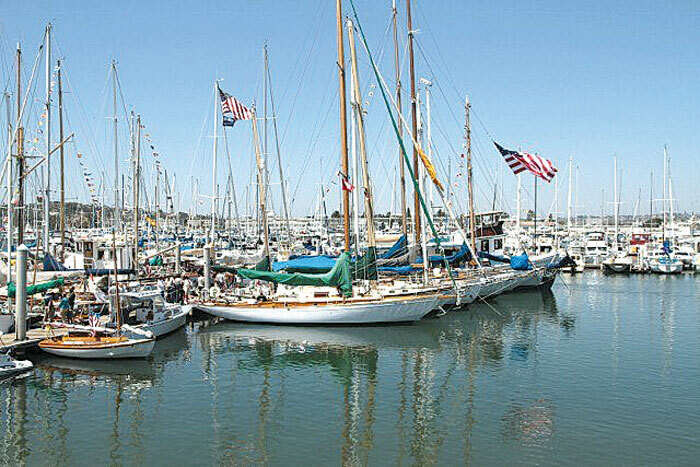 Featuring more than 70 vessels, the event made for an ideal weekend for boating enthusiasts. Event-goers did more than just look at the vessels from a distance, as several boats were open for boarding. From small rowboats, sailboats and powerboats to schooners and workboats, many welcomed people aboard. The event also marked the first public viewing of the 2013 Koehler Kraft 28 express launch Neptune and the 1928 60-foot 10-meter class sloop Sally. According to Koehler Kraft, Neptune is a custom-designed powerboat for a San Diego resident, and it features the latest technology in wood/composite construction, propulsion and electronics. Sally, one of the oldest active sailing yachts, recently underwent a two-year reconstruction that included an extensive overhaul with replacements of its planks and original lower composite structure using the latest technology in wood-epoxy lamination techniques. For visitors interested in how the boats were brought back to their former glory, vessel owners were on-site to provide information on how they restored their classic boats. Vessels on display included Fame, a 40-foot schooner that was built in 1910. This boat was restored at Koehler Kraft and was re-launched July 12, 2010 — on her 100th birthday. Dauntless, a 1930 Alden Schooner that raced in the 1930 Newport-to-Bermuda Race, was also on display at the annual show. Seminars on traditional maritime skills and activities for the kids, such as rides on steamboats, were also provided. Musician Ryan Hiller and the band Heritage provided live music throughout the weekend. Booths showcasing everything from sailing societies to marine chandleries were also on-site. And visitors had an opportunity to stock up on equipment at Challenged America’s annual rummage sale. All proceeds from the event went to benefit Challenged America, a San Diego-based recreational rehabilitation, adaptive-sailing program, which was launched by disabled veterans in 1978. Based at San Diego’s Harbor Island, Challenged America offers year-round no-charge learn-to-sail opportunities for children, adults and veterans with disabilities. The organization uses sailing to help disabled sailors build self-confidence, develop new skills and abilities, and foster independence.